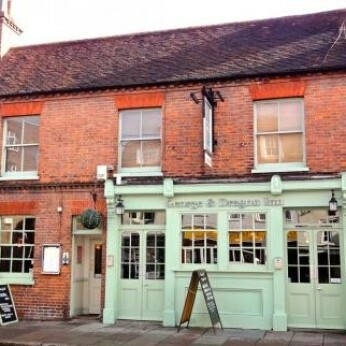 The George is a relaxed pub & smokehouse with comfortable leather sofas, real ales and outstanding food, situated in the historic market town of Chichester. Dating back to the early 18th century, The George stands next to the site of the original north walls gatehouse and is conveniently located just 500 yards from the Old Town Cross and Cathedral. Offering good locally sourced food, a calm and efficient approach to service, The George situates you in an ideal spot from which to discover the West Sussex coast and countryside and is only a five-minute drive from Goodwood racecourse. The busy bar has the warm, friendly atmosphere of a ‘proper’ pub. There are open fires, numerous ales on hand pump and a carefully curated wine by the glass. Our back bar boasts a great range of spirits, with 24 speciality gins. The open log fire warms and welcomes in the winter months and the decking garden beckons in the summer. We give our own unique British take on the delicious style of smoking meat and cooking it in our imported American smoker. Diners enjoy the light and airy space of the conservatory, which has large double doors that open out onto the decked courtyard for alfresco dining in the warmer months. Dishes are prepared passionately and imaginatively by the head chef and his dedicated team. Weekends at The George comprise of our hearty breakfasts and our now ‘legendary’ Sunday Roasts. Booking is recommended in either our conservatory dining room or bar area, however the same menu is available in the Bar (and in good weather on the sun decking garden). We don’t have a children’s menu, but our chefs are happy to make smaller portions or simplified versions of dishes on our menu. Happy St. George’s Day! What could be more English than a visit to a proper pub named after the man himself? Come and raise a glass to the country’s dragon-slaying saint.